Hello! Welcome to the Hacking family website with Sue, Jon, Chris, Amanda, and Arthur (the cat) on Ocelot, our 45-ft catamaran. We've started out in the Caribbean, heading basically south, then eventually west through Panama. Our goal is to stay out for two years, and probably end up in New Zealand or Australia, where we'll either sell or store the boat and return to the States. New On The Site - Check it out! We've updated the Landfalls page with better maps, more pictures, Chris's opinions, and some history of the islands, as well as adding a Flora and Fauna page. Check out the updated Ocelot pages to see photos of our actual boat with us on it (as opposed to the photos snatched from other Kronos 45 websites long ago). If you didn't read Amanda's pages before, check out her Old News area to catch up on what we've been doing. She also has lots of new photos on her site and Arthur's page. Chris has added photos to his site especially on the equipment pages. Sue has new recipes, and some more birding. We've also added a site map in case you get lost. And don't forget to check below for the latest quiz Questions. I guess we've now become the new Windward Island Express. 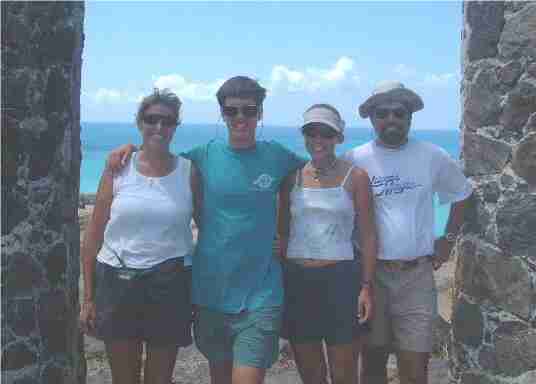 We picked up Gina and Terry Cole in Guadeloupe a month ago and sailed south to Martinique with them. 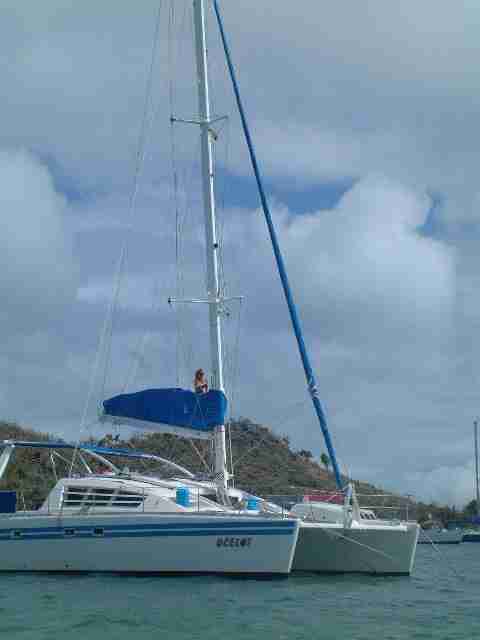 Then we hopped across the channel down to St. Lucia to pick up Emilie Cobb, and sailed back north to Martinique with her. Now we're about to push off for Guadeloupe again before heading south for hurricane season. Cruisers who don't have friends come visit don't do this sort of thing, but if we didn't have friends come to visit we wouldn't be having half as much fun! What is the one fish we have caught in five months? What skeletons do we collect? 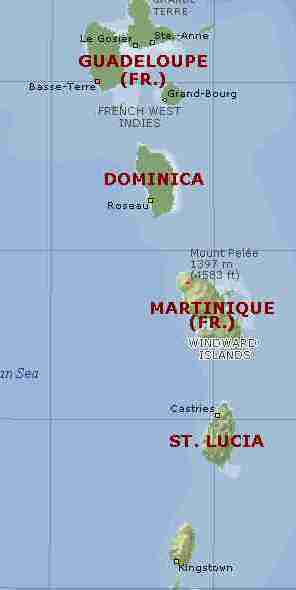 Why shouldn't you sail near the southwest corner of Montserrat? What does Arthur hate the most? What Caribbean island rebelled to win back its colonial status? If you're wondering where we are, or where we've been, (and what we each thought about it) check out the Landfalls page. On the Ocelot page you can see pictures from all over the boat, and read its specifications and our impressions of the boat. If you want birds, recipes, and comments on the cruising life and changes to the Caribbean in the past 14 years, check out Sue's pages. Chris writes about his projects and schooling. Amanda brings lots of pictures, plus stories about our adventures in Africa and New Zealand and Australia from past trips.